Mitt Romney's self-confident and commanding performance combined with Barack Obama's virtual no-show at the first presidential debate turned around the race for the White House more than any other debate in the 52-year history of these exercises. In the second debate, the former Massachusetts governor held his own and then some on substance against two opponents -- Obama and self-disgracing moderator Candy Crowley -- while delivering devastating indictments of Obama's stewardship. Team Obama has not stopped the bleeding. But as well as he did in the first two presidential debates, Romney missed several clear opportunities to make three crucial points. He has only one more chance to make them. If he does, he could turn what is beginning to look like a victory into a mandate. Perhaps Romney has failed to assert the three important items which follow because he and his advisers have fallen into the "everybody knows these things" trap. Most people don't know them. The first: the government, with Obama's eager acquiescence and Senate Majority Leader Harry Reid serving as gatekeeper, has not passed a budget since April 9, 2009, over three and one-half years ago. It's bad enough that this situation has been a major factor in locking in trillion-dollar deficits for four consecutive years. What's worse is that it has fostered an unaccountable and all too often lawless "anything goes" environment throughout the government. The latest example: Health and Human Services Secretary Secretary Kathleen Sebelius' transparent attempt to avoid hitting Medicare Advantage participants with steep pre-election, Obamacare-driven premium hikes and benefit reductions by creating an $8.3 billion "demonstration project" which the Government Accountability Office has said can't possibly "demonstrate anything." In layman's terms, it's a slush fund whose sole purpose is to protect Obama's standing with seniors until after the votes are counted. The second point is also budget-related, and ties directly to Obama's whining about excessive partisanship. The president has been quite successful in uniting Democrats and Republicans in bipartisan agreement on one thing: their opposition to his own budget proposals. In the most recent examples, both the House and the Senate unanimously rejected Obama's February attempt earlier this year. A friend called me Thursday morning in utter exasperation over these first two points, telling me that he had discussed them with two dozen people during the past several days. He emphasized that he considers these relatives, friends, and professional acquaintances far more informed than the average American, and that they all try within the constraints of their busy schedules to keep up with current events. Not one of them was aware that the federal government has been budget-free during most of Obama's term, or that Congress unanimously rejected the president's submission this year. This is largely because the establishment press has kept these facts virtually hidden. 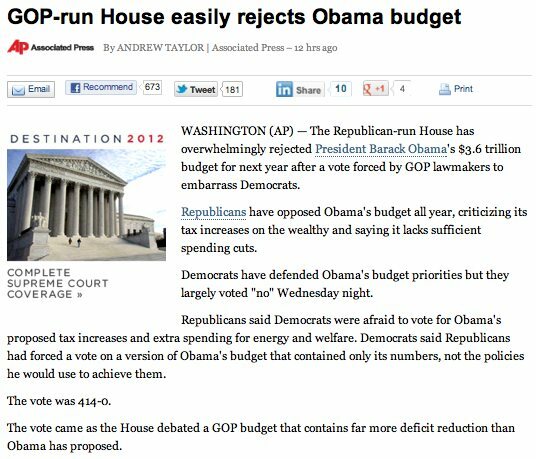 After the House vote in May, the headline at the Associated Press, aka the Administration's Press, was: "GOP-run House easily rejects Obama's budget." The wire service's Andrew Taylor didn't acknowledge the unanimous roll-call rejection until his fifth paragraph.